This free dinner will include a menu of Kalberwurst, Ham, German Potatoes, Green Beans, Copper Penny Carrots, Applesauce, Zopf Bread, and Cookies. Two beer tickets will also be provided for each adult. 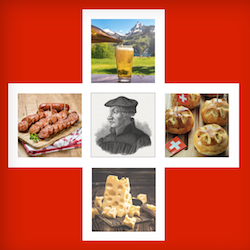 Pastor McShaffrey will offer a brief presentation after supper on the “Affair of the Sausages” which sparked the Swiss reformation in 1522 under the leadership of Ulrich Zwingli.